As the Read Manchester campaign continues to shine a spotlight on reading across the city, a primary school in Manchester has received a prestigious award for reading. St Augustine’s C of E Primary School in Monsall is one of fifteen schools across the country to win ‘School of the Year’ at the Reading Recovery Awards, organised by the International Literacy Centre at the Institute of Education in London. Reading Recovery is a 20-week-long programme which supports five and six year olds with the lowest levels of reading and writing to reach age-expected levels by the end of Key Stage 1. St Augustine’s achievements in delivering the programme, of which the principles have underpinned the teaching of reading across school so that all children can benefit from the it, were recognised at an awards ceremony in London on 7 July, which celebrated and honoured practitioners who have made an outstanding contribution to children's literacy through Reading Recovery. The one form entry school has demonstrated an impressive commitment to improving reading outcomes in recent years, they invest in two Reading Recovery teachers and next year will be the ninth consecutive year they have run the intervention. As well as the Reading Recovery programme, St Augustine’s is also involved in the Read Manchester campaign. The school has participated in sessions at local libraries 10 times in the last year, including a visit to the Nick Sharratt exhibition, Pirates, Pants and Wellyphants at Manchester Central Library. 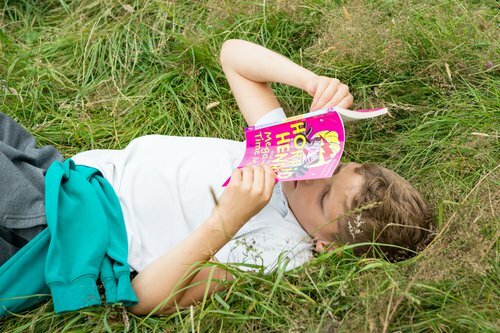 "We are delighted to have been given this award and that our hard work and commitment to improving children's literacy has been recognised on a national level, especially during the Read Manchester campaign. We firmly believe in the initiative "Every Child a Reader", the whole school approach that stems from the Reading Recovery intervention as by using the principles of the intervention, in particular specific praise and feedback during guided reading, the impact on children's progress is significant. We have achieved pleasing results in the Key Stage 2 SATs this year, with children who had Reading Recovery achieving age related expectations and in 2 cases, working at greater depth."